The beautiful Panamanian Golden Frog (Atelopus zeteki) is considered Critically Endangered by the International Union for Conservation of Nature. Only three animals of this species have been seen in the wild since late 2007 and it is now quite possibly Extinct in the Wild. Fortunately for the species though, approximately 1,500 animals still exist aboard the AArk, thanks to the work of Project Golden Frog (www.ProjectGoldenFrog.org) and the El Valle Amphibian Conservation Center (EVACC) (www.houstonzoo.org/amphibians/) in central Panama. 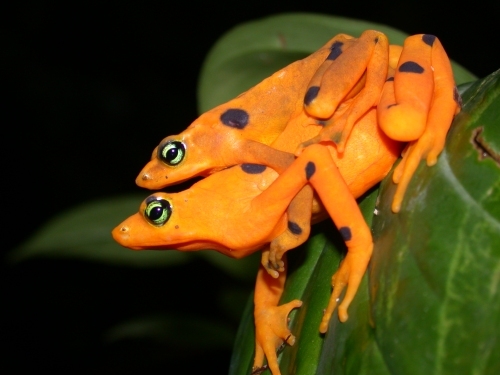 The Amphibian Ark is currently trying to help create a dedicated facility in Panama, at the EVACC, to house an expanding population of golden frogs that will hopefully someday be used for reintroduction back into the wild. Work on building this his facility is almost complete, but requires an additional $15,000 to complete. Please give the gift of gold – make a donation (maybe in someone else’s honor) and help us to save one of the most spectacular amphibian species, the Panamanian Golden Frog, from extinction. Please click here to make your donation.